"Elephant Don: The Politics of a Pachyderm Posse," by elephant expert and Stanford University's Caitlin O'Connell, is an outstanding book, based on more than twenty years of detailed research, about the lives of individual animals living as friends and rivals in Etosha National Park, Namibia (more details can be seen here, and the Kindle edition can be found here). In this monumental work you'll meet Greg, the Don, along with Abe, Keith, Mike, Kevin, Torn Trunk, and Willie. "Though 'Elephant Don' is Greg's story, it is also the story of O'Connell and the challenges and triumphs of field research in environs more hospitable to lions and snakes than scientists. Readers will be drawn into dramatic tales of an elephant society at once exotic and surprisingly familiar, as O'Connell's decades of close research reveal extraordinary discoveries about a male society not wholly unlike our own. Surely we've all known a Greg or two, and through this book we may come to know them in a whole new light." "'Elephant Don' is truly a winner in many different ways. The best way to learn about the magnificent animals with whom we share Earth - or with whom we are supposed to peacefully coexist - is to meet them up close and personal, by name, by social relationships, and by their daily and sometimes hourly ups and downs. By reading the autobiographies detailing the roller coaster of emotions of a pachyderm posse we experience their own and other's life's challenges, and we see them as the unique individuals they truly are. In this landmark book we also learn about the ups and downs of doing extremely difficult, highly rewarding, and incredibly important field research. There surely is no one better than O'Connell to tell the stories of the animals she knows so well, to see how what they actually do meshes with extant models and theories, and what it's really like to conduct this sort of research with a team of incredibly dedicated researchers, all of whom also are unique individuals. I will share this book widely. It is that good." When the book arrived at my home this week I immediately jumped into it. Although I had read it before, I just couldn't put it down. And, I found myself going back to it repeatedly to read about the complex social organization and emotional lives of these amazing beings who are fighting for their very lives in areas where they overlap with humans. 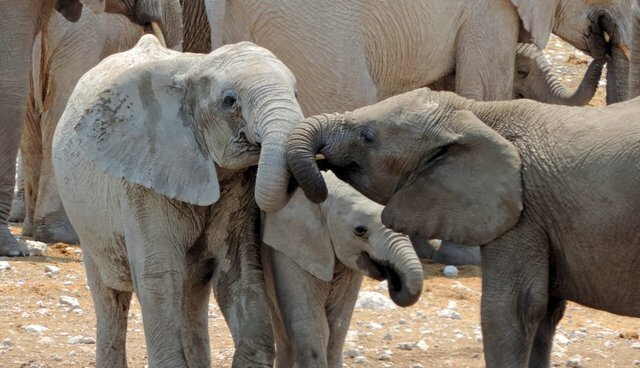 When we view elephants and other nonhuman animals as individuals, I hope they will find themselves the recipients of deep compassion and empathy rather than hate and lethal weapons. There are no substitutes for long-term field research on identified individuals and, as you read Dr. O'Connell's book, you'll feel like you're right there with her, her incredible team of researchers, and these most interesting and amazing animals. Written for a broad audience, not only researchers, I hope "Elephant Don" enjoys a global audience. This book can really make a positive difference in the lives of these most amazing and majestic beings.